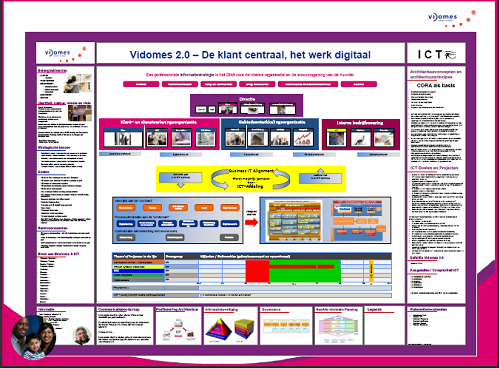 Housing Corporation Vidomes is heading towards innovation with their IT 2.0 project. In the near future all workplaces need to support flex working. Many workplaces and applications, services and data on the workplace are not enabled for the web or can be used via remote access. For email, almost everyone needs to come back to the office. In order to realize flexible workplaces in the Vidomes 2.0 program, Dragon1 was used to make the IT 2.0 strategy communicable and decidable to replace some of the not web-enabled applications and the non-remote applications. Having a visual overview the board was more effective in communicating opportunities, taking decisions and solving issues. Dragon1 is now chosen as the company enterprise architecture tool for communicating vision & strategy.